Definition - What does Hasta Padasana mean? Hasta padasana is a standing yoga pose in which the practitioner roots one leg and, while balancing, holds the other leg out in front of the body in a fully extended position. The term is derived from the Sanskrit hasta, meaning "hand," pada, meaning "foot," and asana, meaning "posture." This physically rigorous pose requires a high level of concentration and pranayama, "breath control." Hasta padasana is also known as hand-to-foot pose in English. As with every pose in yoga, this position begins with, and is sustained by, the breath. On the inhalation, the practitioner establishes focus and strongly roots the supporting leg. On the exhalation, the non-rooted leg begins to lighten. At the beginning of the following inhalation, this leg rises and its knee travels to the chest. During mid-inhalation, the fingers of the hand corresponding to the lifted leg wrap around the big toe and the leg is gently extended forward. 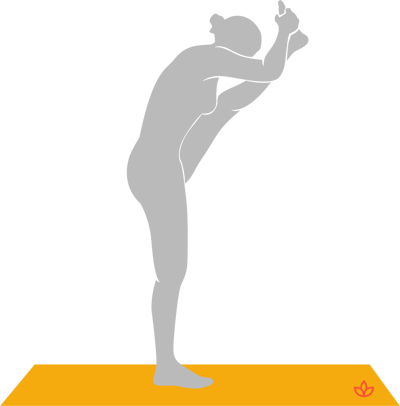 Full inhalation finds the leg, with flexed toes, in its final, extended position; and the exhalation further grounding the supporting leg. A more advanced pose can be achieved when the practitioner, after beginning inhalation, gently moves the raised leg from the forward position out to the side of the body. Hasta padasana has many spiritual benefits. As it reunites the front and back of the body, it awakens and synchronizes the breath and the mind. Every aspect of the practitioner's being is engaged and the result is a deep sense of awareness and spiritual equilibrium.